Two San Diego environmental advocacy organizations announced their support for Measure G Friday, the SDSU West initiative, and their opposition to Measure E, the SoccerCity initiative. Representatives of the Endangered Habitats League and the San Diego County Democrats for Environmental Action endorsed the SDSU West plan to redevelop the current SDCCU Stadium site while calling the competing SoccerCity redevelopment plan “dangerously flawed” for what SDSU West supporters argue is a lack of a California Environmental Quality Act review on SoccerCity’s environmental impact. A third environmental group, the San Diego Audubon Society, attended the announcement but clarified later they were opposed to SoccerCity but had adopted no position, for or against, SDSU West. SoccerCity project manager Nick Stone argued last month that the measure’s plan complies with CEQA by allocating $50 million in funding for things like traffic improvements. SDSU West is an initiative backed by the Friends of SDSU alumni group to redevelop the SDCCU Stadium site into a 35,000-seat stadium for San Diego State University football, commercial and residential space, a river park and a campus extension. The environmental activists joins a large list of local politicians and advocacy groups that support SDSU West, including San Diego County Supervisor Greg Cox, San Diego City Council members Barbara Bry and Lorie Zapf, the San Diego Regional Chamber of Commerce and the San Diego Democratic Party. SoccerCity is a similar plan to renovate SDCCU Stadium backed by La Jolla-based investment group FS Investors. The initiative contains plans similar to SDSU West for commercial and residential space and a river park while building a slightly smaller multi-use stadium, at 23,500 seats, that would accommodate football and soccer. 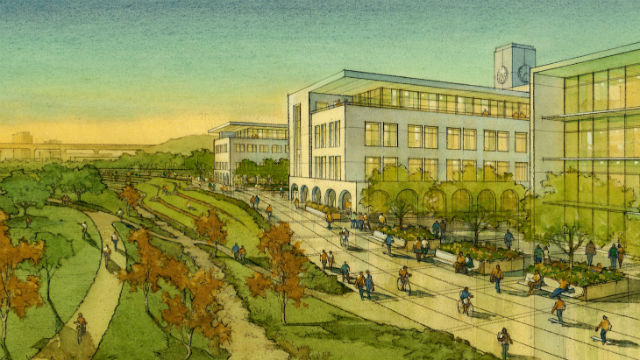 The plan doesn’t specifically include a campus extension the way SDSU West does, an oft-cited reason for opposition by SDSU West endorsers, but supporters say its text has enough leniency to allow SDSU to build a campus extension. SoccerCity supporters include former Olympic soccer stars Landon Donovan and Shannon MacMillan, San Diego Mayor Kevin Faulconer and San Diego City Councilman Scott Sherman, who represents the district containing the SDCCU Stadium site. If both measures receive 50 percent of voter approval in the November election, the measure with the higher percentage of voters would win. Supporters of the winning plan will be able to negotiate the purchase of the stadium site from the City of San Diego.